We can’t wait to see how great our favorite apps will look on Android L and its gorgeous new Material Design UI. This concept video that takes elements of Material Design and applies them to Instagram to give us a sneak peek at what the app will look like once Android L releases this fall. As you can see in the video, the Instagram concept features both the new app animations and the flatter design that Google unveiled at Google I/O last month. 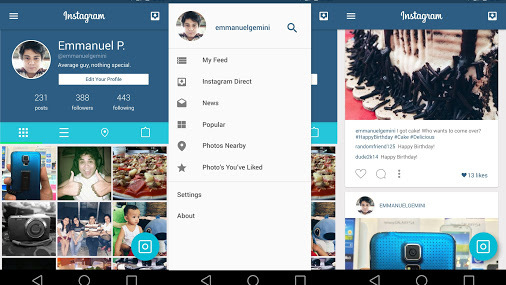 The concept, which was designed by +Emmanuel Pacamalan, really shows us how Android L can help developers be more creative with how their users can interact with their apps and how they can make their mobile apps look better than ever before. The overall look of Instagram with Material Design is flat, properly laid out, and perfectly utilizes the new circular button in the bottom righthand corner. Will IG on Android ever see a look like this? Highly doubtful, as the company would rather it look more like an iPhone clone. But regardless, our fingers will be crossed. We hope that Pacamalan makes Material Design concepts for more apps going forward.